Do you have an aggressive cat? Bach flowers can help! Aggression however, is very often wrongly interpreted. 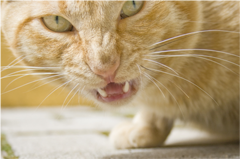 Many people think that an aggressive cat shows this behaviour out of anger or dominance. In many cases, this isn’t exactly right, there are plenty of reasons as to why a cat can express aggressive feelings. The most frequent forms of aggression are born out of anxiety or frustration. Aggression coming out of frustration occurs frequently in kittens who are bottle-fed. If kittens are educated by the mother cat, they receive important lessons from nature. They have to be patient when waiting for a drink if the mother cat decides to impose this. When your cat is raised by hand, then it doesn’t get this important life lesson.